Hey everyone! I'm back! keeping myself busy and practicing constantly. This is the third recent piece I want to take to the shop where another artist will curate my work and decide wether or not it's good enough to put on her gallery/shop. So before I actually go and do that, any thoughts? something I missed? I recognized the reference picture you used and I made the corrections according to that. In your painting the face is really squished. The eyes are too low which makes the forehead look huge and the nose has and odd bump on top of it. There is also the overall shape of the head, which seems to be too rounded. The neck is also very thin and long. I recommend measuring the facial features on your reference picture and use that as a guide on your painting to get more accurate proportions. 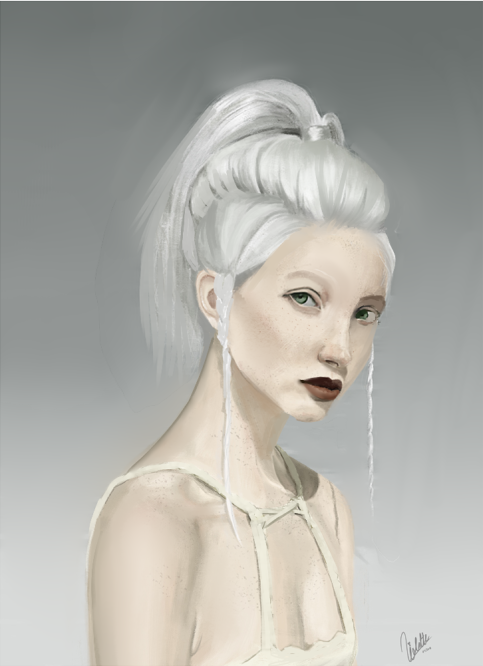 The skin tone is good but I would recommend blending a bit more since now the gradient between values is a bit too harsh. Also the hard texture on the face and body is distracting. I think there is also some unnecessary detail on the girl's top. The X- pattern on the ropes feels really unnatural and takes too much attention away from the face. Same with the background. There is also some things I would change about the hair but I think the biggest thing is the harshness of the hairline. So I would make that more subtle. Hopefully this was helpful and good luck practicing! Alluffer wrote: I recognized the reference picture you used and I made the corrections according to that. There are some things I agree with and some others that I don't. I agree, the texture is kind of distracting. Also the rope thing. Realized that too late. I'll try to tone it down. As for the propotions, I'm not totally convinced. In your paintover, the eyes are a bit too wide, losing the expression. Maybe you're right, the face could be a bit longer, but I don't think is necessarily bad. Again, I think it looses a bit of expression, I think there's too much space between the eyes and the nose. I would even dare to say that in the reference her face is rounder than in both our paintings. Lsatly, the hard strokes are a personal choice of style. Both in the face and hair. It's just a thing I do intentionally. This brush I use is very akin to oil on a canvas and I like to add strokes that resemble that. Still, I followed your advice and made corrections based on your thoughts while still mantaining mine. Here it is, I think it did improve. Sadly I can't do much about the background anymore because I accidently saved the PSD file when I made it smaller to post here, so it lost a lot of quality. I can't make it big again. I just painted over the high res JPEG.